Probably a final gig on Live and Loud! for the Mk 1 lineup - there aren't many recordings of them and the best one, from Amsterdam, I've already done (here). The others (including this one) are audience recordings and mostly not very good ones; this one is the clearest I've come across and even this has taken a lot of work to clean up. Still, it''s a full set and so well worth preserving! 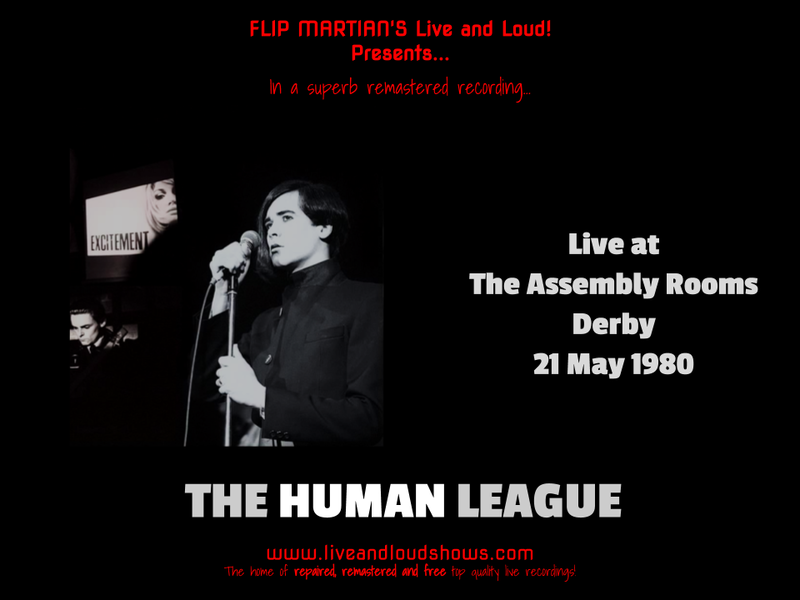 So...this is an audience recording of The Human League - warts and all. Analogue synths occasionally (!) go out of tune, there are bum notes...some great backing vocals on some songs from Martyn Ware - this is a proper live recording. I tidied up some differences in volume and used a lot of 30 band EQ to bring back some bottom end (you can hear the kick drums and bass synths far better now), toned down the harsh top end and made the recording clearer. I also worked on the sound to widen it - this was originally recorded back in 1980 on a little mono tape recorder, so kudos to the original taper for getting a clear recording for me to work on 38 years later... Hopefully if he ever comes across this, he'll like this improved version. You can download this improved recording for free here as one tagged 320 kbps MP3 file. Or, if you would like to support the site with a small donation towards storage subscription and internet costs, in return you can have the show as separate, properly tagged MP3s or even lossless files in FLAC format; head on over to the Donations tab to see how you can do this. Hi Tomas. Very pleased you enjoy the recording. I do have some later Dare period live recordings - 1 is likely to be coming in a few months. So do keep checking the site.